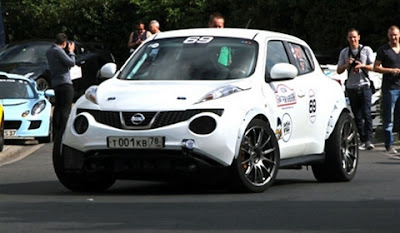 Nobody has ever wondered, but now we know that 6 seconds is enough if you want to have a bad time with a Nissan Juke-R. Hopefully it's not an original Juke-R, but it's a standard Nissan Juke whom had a transplant from a Nissan GT-R; still, it must be a very expensive car and with 850 japanese horses under the hood, it's certainly a car that needs to be tamed which is not really what this potential customer is doing. How did that person get behind the wheel? Ouch! The launch must be eye popping!! The 545bhp model costs about £400,000 GBP so the one that crashed cost a lot more. Launch control was defective when they used it on the car, hence the crash.